Khalifa Industrial Zone Abu Dhabi (Kizad), the industrial zone located in Al Taweela area and operating under Abu Dhabi Ports Company (ADPC), is the centerpiece of the on-going activity in Abu Dhabi’s industrial market. The zone is fast developing into a regional manufacturing hub and remains the nucleus of overall industrial activity in Abu Dhabi, with international logistics firms vying for a presence in the UAE’s largest free zone. 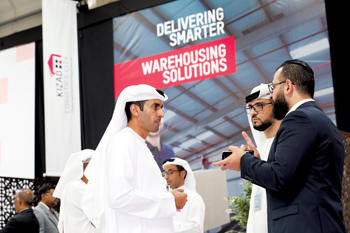 Its recent initiatives such as the launch of the Kizad Logistics City or the announcement of a 100-sq km expansion earlier last year is further driving investments and growth in the sector. The operator added a new free zone – the new Khalifa Port Free Trade Zone (Khalifa Port FTZ), totalling 100 sq kms, which houses eight logistics and four industrial companies, spanning industries such as aluminium, automotive, pharmaceuticals, food processing, packaging, polymer converting and other industries that rely on Khalifa Port. The new free zone serves as a next-generation platform for trade, logistics, manufacturing, and consumer goods and offers a flexible master plan that is capable of accommodating more industries in the future from a land use perspective. The ultra-modern facility also provides unparalleled advantages for businesses including competitive lease prices and some of the lowest utility costs in the world – all under a tax-free umbrella. The free trade zone offers investors 100 per cent foreign ownership, 100 per cent repatriation of capital and profits, competitively priced shipments and efficient customs procedures, among other value-added benefits. The industrial hub is the first industrial zone in the region which offers both Free Zone and Non – Free Zone status. This model provides opportunities for both types of business to maximise the benefits of their customs schemes. The zone has in the recent months seen big ticket investments pouring in. Last month, Kizad announced the launch of the first “on-demand” warehouse solutions offering in the Middle East. The move has been taken in response to the demand for more flexibility from retailers, shippers and logistics companies, it said in a statement. It offers free zone and non-free zone warehousing solutions spanning over 1.3 million sq ft, equivalent in size to about 17 soccer fields. The warehousing is suited to luxury goods, high-value retail items, food and pharmaceuticals with each unit having its own dedicated loading yard with ramp access for forklifts and ample on-site parking, the statement added. All facilities can be booked on demand, without the need for long-term lease contracts and are available for a range of business needs, starting from 10,000 sq ft.
Abu Dhabi Ports CEO Captain Mohamed Juma Al Shamisi said: “The rapid expansion of e-commerce in the region and same-day delivery models are reshaping warehousing needs. In another move, Kizad signed an agreement with Shaheen Chem Investment for the land lease of a two-phase chemical complex in the industrial zone with an expected investment of Dh4 billion ($1.08 billion). The plant will support the UAE’s growing chemical manufacturing sector as well as supply major industrial giants such as Emirates Global Aluminium (EGA) with raw material, said a statement from Kizad. Shaheen Chem Investment will also pioneer the production of ethylene dichloride in the UAE, showcasing Kizad’s role as an industrial hub for the country. The complex will come up over a dedicated 330,000 sq m area in Kizad, in addition to a dedicated port terminal at Khalifa Port, it stated. The first phase of the plant is expected to produce 130,000 tonnes per year of caustic soda for EGA’s Al Taweelah alumina refinery and 160,000 tonnes per year of ethylene dichloride. Upon completion of the second phase, caustic soda production capacity will double and the plant will expand operations with vinyl chloride and polyvinyl chloride production, said the statement from Kizad. “Through this signing, we are reinforcing our commitment to promote growth and trade as well as providing our valued customers from a wide range sectors convenient access to raw materials and the Khalifa Port facilities, as well as international standard infrastructure,” he added. Gulf Printing and Packaging, a subsidiary of printing and packaging materials producer Al Khat Packaging, opened a new direct food contact packaging factory in Kizad. The company is the first food and beverage packaging facility to start operations in the industrial zone. 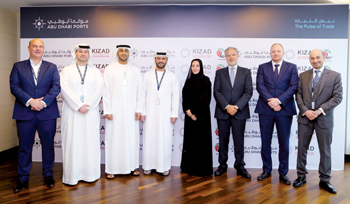 Located in the Food & Packaging cluster in Kizad, the Dh100 million ($27.2 million) facility will serve as the company’s base in the UAE, Gulf Printing and Packaging said. Expected to employ over 200 people, the facility will feature printing and packaging equipments from Heidelberg, Bobst, Kohmann, among others to produce folding paper packaging and printing products for brands in the UAE, as well as regional and international markets. The firm plans to undertake all of its export and import activities via Abu Dhabi Ports’ flagship port, Khalifa Port. Gulf Printing and Packaging, which is the exclusive provider of all print carton materials for McDonald’s in the Gulf Cooperation Council (GCC), plans to print all the packaging used by McDonald’s in the UAE and Oman in the Kizad facility this year. Captain Al Shamisi commented: “We are proud that leading companies, such as Gulf Printing and Packaging, chose Kizad as a home from which to expand their business. Gulf Printing and Packaging CEO Mohamed Abou Khalid said: “The new facility in Kizad is a centrepiece of our expansion strategy. During the event, the new brand identity of Gulf Printing and Packaging was also unveiled. “We look forward to continue serving leading brands in the Mena region through enhanced supply chain efficiencies from our new location,” said Abou Khalid. Gulf Printing and Packaging joins other global and regional food-industry related clients such as National Food Product Company’s (NFPC) and Brasil Foods (BRF), who have chosen Kizad as its base of operations in the UAE.